This is one of my favorite go-to temples in the bay area! I've been coming here for couple of years now and my impression about the place is only rising upon my each visit. Appreciate the efforts put in forth by the temple associates, for they do a wonderful job in maintaining the purity of the sanctity and also the traditions. The entire area inside the temple is spacious and apart from Shirdi Sai Baba's shrine in the main prayer hall, there are shrines of other Gods & Goddesses as well viz., Siddhi Vinayak, Shiva, Vishnu, Kali Bari, Navgraha prahar etc. It's called the BayArea Hindu Temple, a part of this Shirdi Sai Darbar. So, whenever I visit this place, I feel like I've offered my prayers to all Gods in one go. Recently attended Shirdi Sai Baba's Palki Procession on Shri Sai Baba Maha Samadhi Festival and I must say, temple organizers did really well. I've joined the other celebrations hosted here and every time I go home with immense peace and happiness. Once I was one among those fortunate devotees to receive Baba's Murthi (Idol) for free. They do distribute Free Baba Murthi every year on temple's anniversary day (Subscribe to their updates, you'l be notified about this every year). Temple authorities treat all visitors and devotees with due respects, which is one of the main reasons why I keep coming here. The temple is clean and street parking is available. Although I warn you to come here early during important occasions. Parking spots around the temple gets full at such times. (Believe me, their email updates are very useful for me as a devotee). Temple welcomes volunteers for Prasad (Food offering) preparation or distribution, singing in praise of God etc. 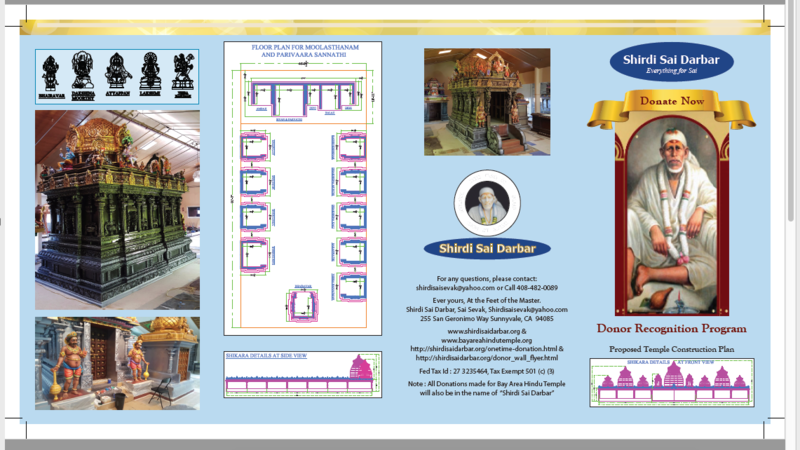 Interested visitors/ devotees, plz check out their websites. I will keep coming here! Om Shri SaiRam! All SAI KRUPA, JAI SAINATH. Everything is Best about the temple. I moved to the Bay Area about 15 months ago. I was extremely happy to find out that there was a Baba temple close to home.Every time I enter the temple I feel I am entering my home. That is the sense of comfort and peace I feel when I step foot inside the temple.I also see that in the happy faces of the people who come to pray here. There are different service activities organized in the temple which one can participate in, like the sandwich Seva that happens every 3rd Saturday and the Sai Satcharita Paarayan that happens every 4th Saturday of the month. All major deity idols have been installed in the temple.All major festivals are celebrated grandly. 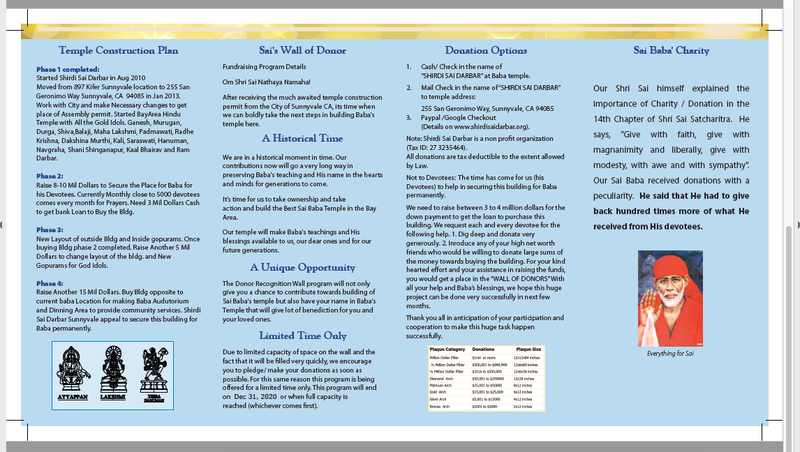 Anyone coming new to the Bay Area can quickly settle in just by participating in the various activities in the temple.There are lots of opportunities to volunteer in the temple activities too. The sense of peace I feel in the temple helps me connect with Baba instantly. The Shirdi Darbar temple is an abode of comfort and peace, where people can worship Baba from close quarters by touching His Feet. One gets the same feeling as you would, when you worship Baba at home.
" This Temple is the Best I have seen in USA"
I would like to share my experience. I pass by the temple every day when I return from work & I stop by at the temple for just a few seconds because the temple is closed sometimes & sometimes it's just a real busy day . So I take ashirvad from baba's & Ganesh Ji murti outside. I just started doing this a few months ago and I feel a big difference in my life. I feel like baba is watching over me for any troubles. Everything started going way smoother. My husband had his spine surgery finally after going to the DR for almost 2.5 years and no one wanted to operate on him but because of babas Kirpa everything went well his surgery was very complex but it went really well. I thank baba for everything. Thank you so much. This Temple is very welcoming and peaceful. I love it.There are all the Hindu Gods in this temple so one gets a complete spiritual experience here. All festivals celebrated here beautifully. Baba is accessible to one and all. Devotees get a chance to participate in the daily activities of the temple such as doing Abhishekam to Baba in the morning, giving water to the various pictures and idols of Baba and most importantly Everyone is allowed to go near baba touch his feet and pray. It is this personal touch that makes this temple most special to me. I walk into the temple and I feel like I have come to my mother's home. I am surrounded by a feeling of love and find myself enveloped in all the positive energy. I am so thankful to the divine for bringing me in to see and be with them. I consider myself divinely blessed to have all the wonderful people that I have had the privilege to meet at the temple and become an important part of my life. Being here allows me to pray to the divine in several of his forms. In other words it is a one place to get all divine energy, so to speak or one prayer spot for all our needs. I am so glad that the temple is so well located and accessible to a lot of people. Thank you BABA for making this happen so all of us can feel blessed by you.